Consistently soothing warmth. And carefully targeted precisely to the point without the need for time-consuming preheating. The infrared radiant heater IR 2000 S produces warmth following the natural principle of the sun. Equipped with three modern quartz heating rods, it provides the immediate surroundings with cosy warmth from the very first moment and owing to the adjustable inclination angle the generated heat can be aimed precisely. In addition to "Off" , the radiator offers three heating levels (650 W, 1,300 W and 2,000 W) to meet all kinds of individual requirements. You can easily change these heating levels by means of the practical pull switch. Like all infrared radiant heaters of the IR-S series, the IR 2000 S, too, converts a great deal of the energy input into direct heat, which in comparison to a hot air blower increases the performance of the quartz radiator in terms of energy-efficiency. Another standard feature of the series than the clean, silent and odourless heat supply is its suitability for allergy sufferers – seeing as the device gets by without fan, no dust is raised. The IR 2000 S can quickly and easily be attached to a wall or telescopic tripod – for start-up the connection cable of the device is simply plugged into the nearest socket. As per protection class IP34, the appealing exterior protects the device against water jets and splashes. 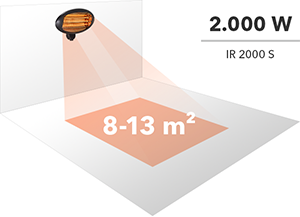 With a width of 500 mm and up to 2,000 watts of power the IR 2000 S can provide infrared heat for many possible applications. The rip cord can be used to single-handedly switch the infrared radiant heater on or off without much effort. Three heating levels can be selected for the operation of the IR 2000 S – depending on how much heat radiation is desired. The steplessly adjustable radiator head can be tilted to an inclination angle of 45°. Entertain and cater for your guests on the terrace all year round – even if the day starts out chilly. Despite all efforts construction sites are often cold and draughty. Good to have a heat source at hand that can be flexibly positioned. Spending longer periods in market stalls or booths you can easily become frozen to the marrow. Why not use an IR 2000 S as countermeasure? The IR 1200 S features 2 heating levels of 600 watts and 1,200 watts. The heater is operated conveniently via an integrated pull switch. 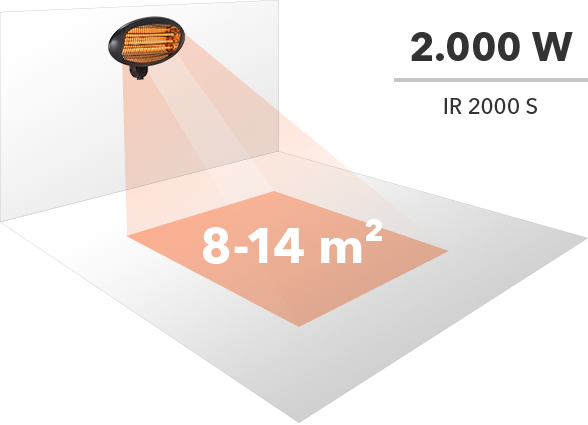 The wall mounted infrared radiant heater can be adjusted by 60° to precisely align the heat radiation. Thanks to its length of 870 mm, the infrared radiator IR 2500 S has a large area of effect and a heating capacity of 2,500 watts provides a wide heating area. The device can be used outdoors and can be precisely aligned thanks to its 90 ° angle of inclination.